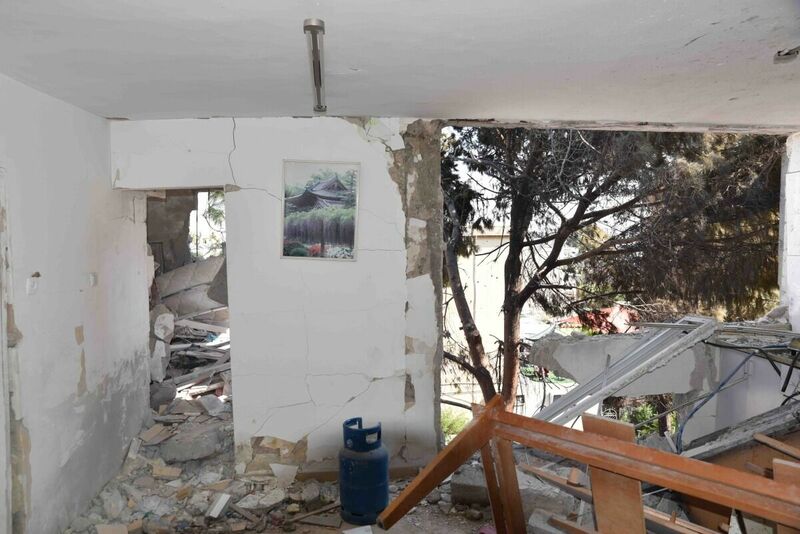 A grad rocket destroyed the eastern half of an apartment building in Ashkelon on November 13. In the 24 hours from Monday afternoon through Tuesday, the Iranian-backed Palestinian group Hamas fired more than 400 rockets and mortars into Israeli territory, a record number of strikes for one day. More than 200 fell into open areas, 100 were shot out of the sky by Israel’s Iron Dome missile defense system, and dozens hit civilian areas throughout the Gaza border region. At the end of the day, one man was killed and almost 100 received treatment for injuries or shock. Looking at the numbers, it could seem that Israel escaped largely unscathed from the barrage. But that is simply not the case. In war, death is only one of the consequences. I spent most of the day on Tuesday with a bus full of journalists inside the Gaza envelope, a 7-kilometer-wide tract of land reaching out from the Gaza-Israel border, which was where most of the barrage of rockets struck. The following is an account of the stops we made and the effect it had on me. 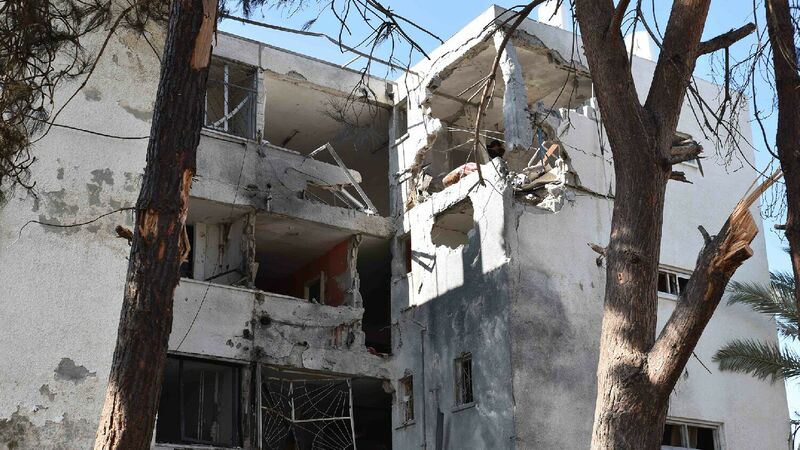 At around 1 a.m. the night before, a Grad rocket eluded the Iron Dome system and struck this four-story building, blowing out much of the eastern portion of the structure. Given that this was an older structure, the apartments were not equipped with safe rooms, so residents had 30 seconds to get out of bed, race downstairs, and enter the bomb shelter outside. I doubt that most would have had time to reach the shelter. On the top floor, a 48-year-old Palestinian man didn’t even hear the Code Red alert and was instantly killed by the rocket. Two women in the building suffered serious injuries, and many others suffered scuffs, bruises and shock. Given the destruction of the building, it’s incredible that there weren’t more deaths. Even the structure next door had shrapnel embedded into its concrete wall. 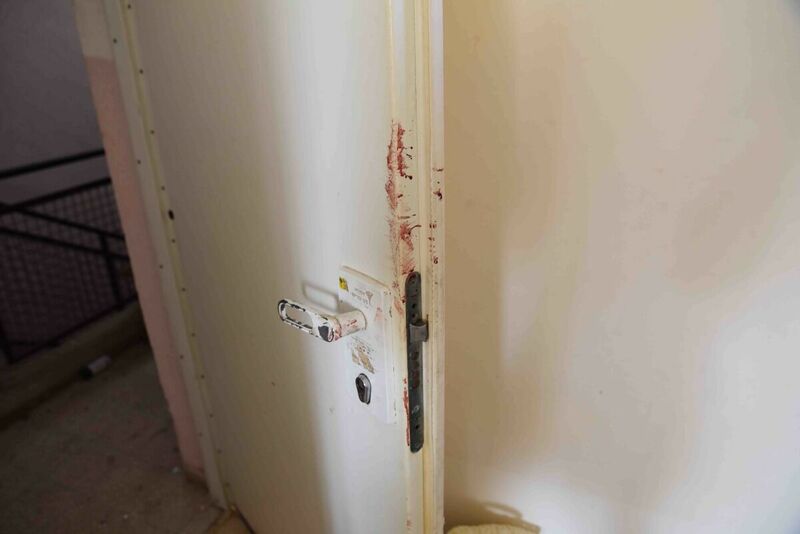 Blood marks the door of a second-floor apartment in a building in Ashkelon (November 13). Our next stop was Hope Street to interview Tzur Zechary, a father of three girls and a 5-month-old boy. The night before, his family was at home, with his oldest girls (ages 15 and 9) playing upstairs and his 3-year-old close to his wife. He was feeding his baby, Tamir, on the couch. As soon as they heard the Code Red siren, they ran to the safe room at the back of the house, closed the door, and heard the blast. 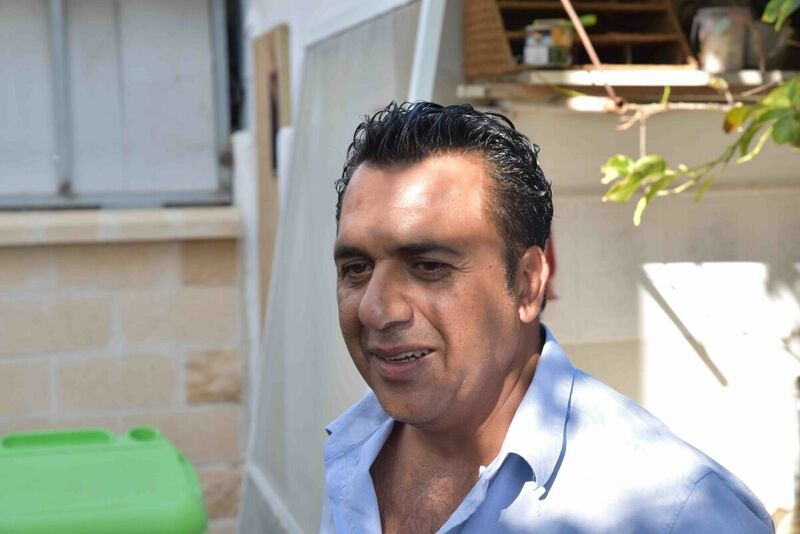 Tzur Zechary’s house was damaged by a missile attack in Ashkelon on November 13. Fighting back his emotions, Tzur described what his family’s life is like, living within rocket range of terrorists who target civilians. He then described how his eldest daughters refuse to sleep in their rooms upstairs and are sleeping instead in the cramped safe room. As I was leaving their house on Tuesday, I found the three girls and a friend. They were playing together as all young children do: It was easy to forget that they were doing so in a bomb shelter. Tzur Zechary’s daughters play inside a “safe room” on November 13. 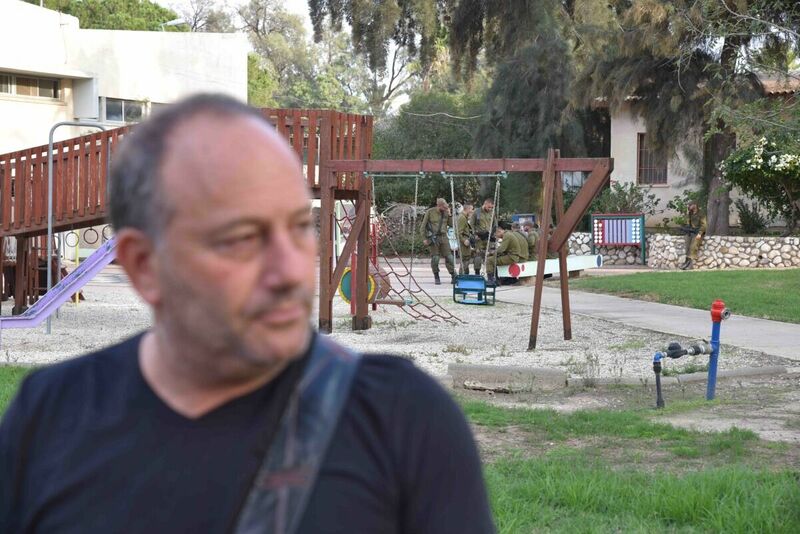 This was my second visit to Sderot, but my first time under an active threat of attack. 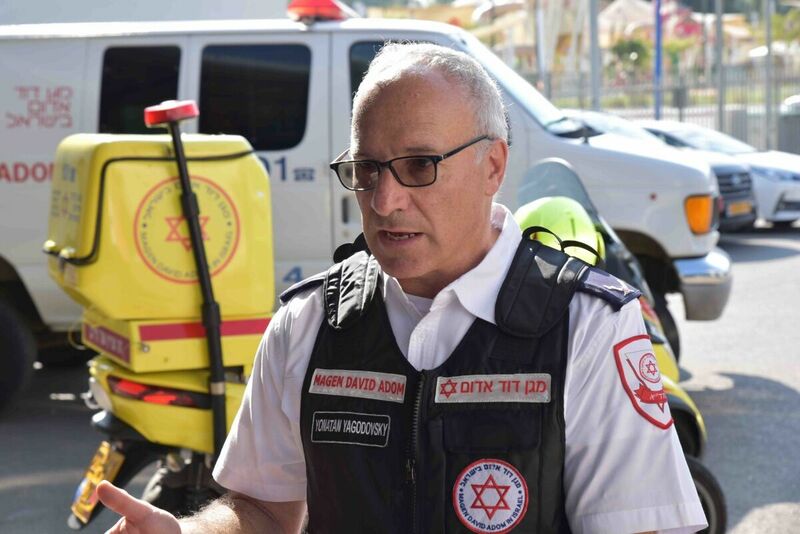 First, we spoke with Yonatan Yagodovsky, Jerusalem director of the Magen David Adom ambulance service. The first thing he did was tell us what to do in the event that we heard the Code Red signal. Then he spoke of the incredible work that first responders do in aiding the casualties of the strikes. He said most of the workers take their work vehicles home with them so that they can respond quickly at all times. As I heard often that day, Yagodovsky expressed that the day’s intense bombardment was merely the latest example of what people in this area have faced for over a decade. This has resulted in severe stress disorders among those who live in these communities. Magen David Adom ambulance services director Yonatan Yagodovsky addresses the media on November 13. “The ptsd, post-traumatic stress disorder, is something everybody here lives with, and copes with,” Yagodovsky said. “Kids, teenagers are wetting their beds. Parents are afraid to go to work, afraid to send their kids to school. As we arrived at the bakery here, it wasn’t the scent of fresh bread that filled our noses but rather the smell of charred remains. The night before, three missiles had evaded the Iron Dome and hit the town. A fourth had been intercepted by an Iron Dome missile: One of its fragments fell into the bakery and ignited more than three tons of gas stored on the premises. The fire had only stopped burning a short while before we arrived. 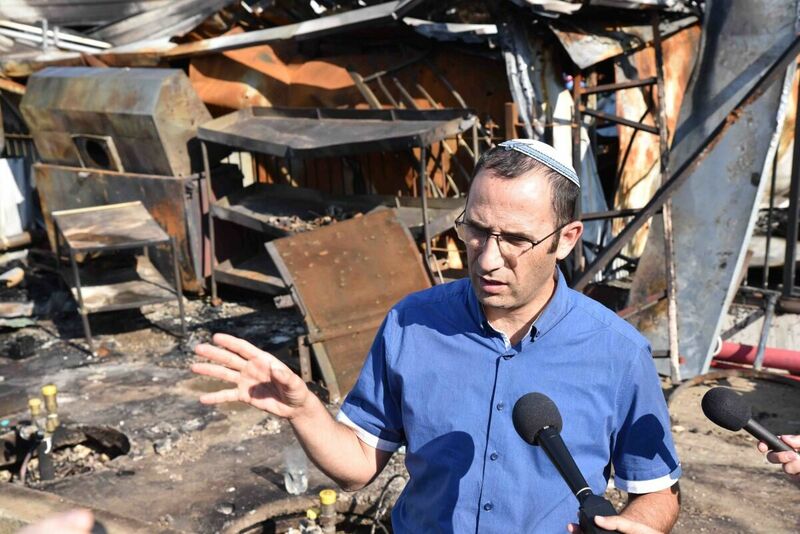 Sderot Deputy Mayor Elad Kalimi discusses the difficulties of living in Sderot on November 13 as he stands outside a burned-out bakery hit by a rocket the night before. “It’s worse than war, because in war you know when it begins and you know you should run to shelter, wait until it ends, and then that’s all. Here, it’s not. Because every minute, you can have the siren, you can hear the rockets, you can hear the Iron Dome, and it’s every minute. At the same location, we talked with Atara Orenbuch about the seven seconds that Sderot residents have to get to shelter. She has six children, most of whom who have only known life under the constant threat of a rocket detonating nearby. Sderot resident Atara Orebuch discusses the difficulties of raising children in Sderot, right in front of the burn-out bakery on November 13. “We all jump at any door that closes too loudly,” Orenbuch said. 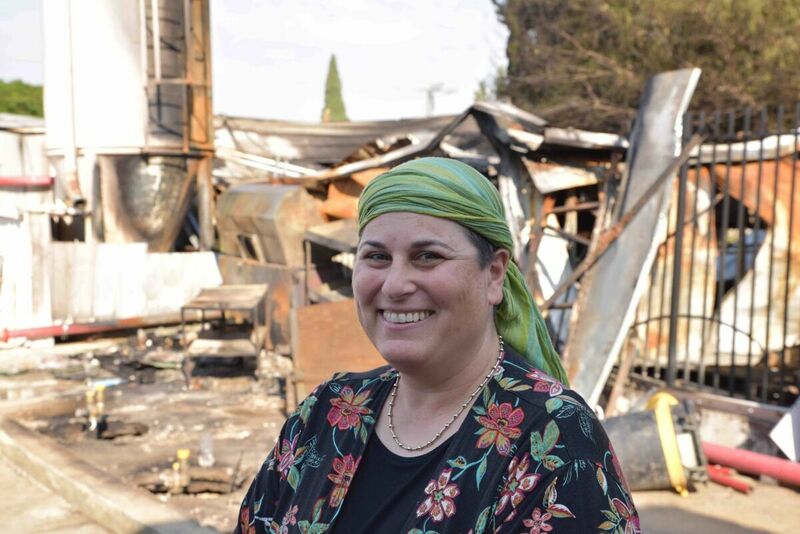 “Even if we leave Sderot, it is part of our system.” Orenbuch, whose cheerful personality is obvious (see photograph below), struggled to get her words out. She said that on Monday, her daughter, who doesn’t live in Sderot, was planning to visit with her grandchild. Our group then traveled south to Kibbutz Kisufim, a small community less than two kilometers from the Gaza Strip, and through which the main road from Israel used to reach Gush Gativ. Gush Gativ was the Israeli settlement area in Gaza that was removed in 2005 when Israel completely withdrew from Gaza. Just prior to our arrival, Kibbutz Kisufim experienced a mortar attack. As soon as we got off the bus, we were told that because we were so near the border and in the open, if we heard a Code Red siren we should just drop to the ground; there would be no time to seek shelter. After talking with the spokesman for the community, we met with Ilan Izekson, chief security officer of the regional council that looks after 60 percent of the envelope. He spoke of the familial relationship that the community has with the military personnel stationed in the region. I couldn’t help but think that it shouldn’t be that way. Not that they shouldn’t be friendly, but that they shouldn’t have to see armed men in fatigues, Humvees and tanks on a daily basis—there to protect you from the threat of a violent death. But such is life when you live close to Gaza. He then spoke of Israel’s need to stay on the border regions, even though it’s dangerous. With our trip complete, we stopped at a restaurant in Yad Mordecai, a small town a few miles from Gaza’s northwestern border with Israel. Sitting at the table with the reporters, we joked (as far as you could joke in the situation) of how we had missed all the missiles that day. Just after we left Asheklon there was a strike. Just after we left Sderot there was a strike. Just before—and just after—we left Kibbutz Kisufim, there was a strike. Being reporters, most were disappointed with the lack of “action.” I too was a little disappointed. Now that everything I heard that day has sunk in more, I am a little ashamed to have wanted to experience the excitement of something that had taken such a physical, emotional and mental strain on so many people for more than a decade. Just as we were getting ready to leave, the Code Red siren sounded outside. Along with everyone else, I rushed to the bathroom. I didn’t hear the missile get shot down overhead, but I assume that it did. Almost immediately, it seemed, the alarm stopped. The employees went back to work as if nothing abnormal had happened. For them, nothing really had. It was part of everyday life. For me, it was more than abnormal. It was surreal. This wasn’t just an alarm. It was an alarm warning me that someone a few kilometers from me had just pointed at me a rocket or missile filled with explosives and shrapnel and ignited it, with intent to kill. The Hamas terrorist hadn’t aimed at me specifically, of course: He doesn’t know I exist. But that fact didn’t comfort me. It was unnerving. That man had launched a rocket for the purpose of killing any and every Israeli Jew he could hit—civilian, soldier, man, woman, little boy, little girl, handicapped elderly person, 5-month-old baby on a couch in his father’s arms. Every Israeli I spoke to while on the Gaza border was hopeful to live side-by-side with the Palestinians—some of whom were causing their children to grow up with ptsd, some of whom were firing rockets, that very day, in an attempt to murder them. While many describe the ongoing wars between Israel and Hamas as being motivated by Palestinian nationalism, it’s impossible not to view indiscriminate rocket fire at civilian population centers as an extension of the world’s oldest racism: hatred of the Jews. On my day on the Gaza envelope, I saw that hatred up close. Over the border in Gaza, what is it that is motivating people to fire weapons capable of mass murder at crowds of Jews? It happens so frequently here that we often forget that every missile that is ignited is a murderous attempt to kill any and every Jew possible. Amazingly, even though anti-Semitism is so commonplace, it is completely misunderstood. The Bible reveals that this spirit of wanting to rid the world of an entire race of people comes straight from the devil. Satan has an intense hatred for all mankind and a special hatred for the biblical nation of Judah—and he spreads it like a disease. This bitter, resentful hate is a contagion Satan is using to direct a great many people in the world today. The truly awesome purpose God has for the Jews—and the rest of Israel too—is something that Satan, the god of this world, absolutely hates. God is not a respecter of persons—He doesn’t view Israel as a people better than others. Actually, God wanted ancient Israel to become a model nation for the purpose of serving those other nations as an example—but Israel failed to do the job. God wants a close relationship with every human being He has created, and Satan will quite literally stop at nothing to prevent that from happening. This is the true, yet astonishing, reason behind the intense hatred for Israel today. The devil hates God’s plan and will do all he can to pervert it and destroy it. For a deeper look at the root causes of anti-Semitism as well as the prophesied end to such a hatred, read Chapter 8 of The Key of David, by Gerald Flurry. Your free copy is ready and waiting for you; all you have to do is request it.